Taunton Street Pastors have responded to the news that they have been honoured as recipients of the Queen’s Award for Voluntary Service in 2014. 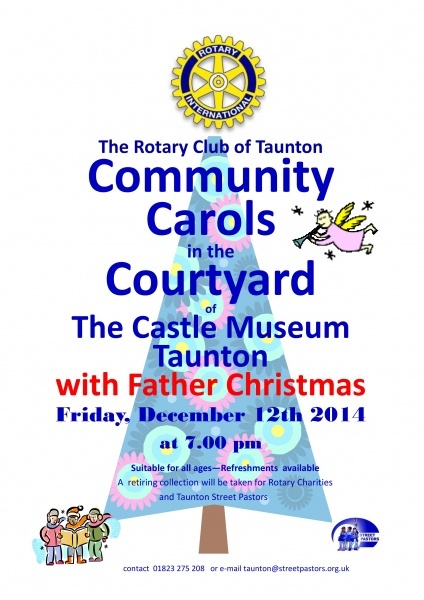 “We are delighted to announce that Taunton Street Pastors team has been honoured in this way. This prestigious award has an equivalent status for voluntary groups as the MBE does for individuals. While we don’t do the work for praise it is very much appreciated when the hard work and dedication of our team of volunteers is recognised by others. Taunton Street Pastors was launched in 2008 in response to high profile problems late at night in the town centre. In common with many other towns and cities, local Christians were unhappy with the way night time-related antisocial behaviour in their community was being portrayed in the media and decided to do something practical. Volunteers whose ages range from 21 to 80 patrol the town in teams every Saturday night and on other significant occasions such as the annual carnival, Olympic Torch visit and the vigil for the M5 tragedy, offering a listening ear, care and practical help. Well known for their free flip flops, bottled water and foil hoodies, they have provided support for more than 25,000 people in the last six and a half years. Contrary to public perception it is not just young revellers who appreciate the help of the blue-uniformed modern day Samaritans. Help has been offered to elderly people, homeless and children on occasions. The citation on the certificate records that the award is made to Taunton Street Pastors for ’dealing with the issues of vulnerable people and helping to diffuse aggressive situations’. 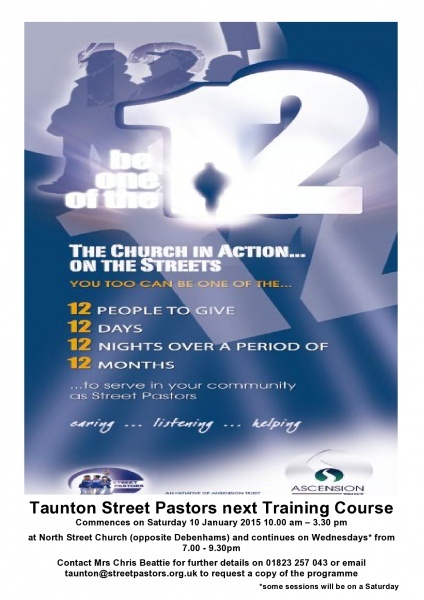 The Taunton team has been recognised by the Street Pastors’ parent body, the Ascension Trust, as a pioneering scheme, most notably developing ‘Safe Space’, a street café on the driveway of North Street Church. The initiative has been copied by other schemes around the country and offers a warm welcome, free hot drinks and biscuits under a canopy where people can wait for friends to meet them or rest until their lift home arrives. A ‘Safe Space’ service was also provided by Street Pastors recently at the Flood Distribution centre near Bridgwater during and long after the bad weather at the start of 2014. The average age is 58. The combined ages of the Taunton Street Pastor team totals 3,814 years. The volunteers patrolled the streets of the County town between 10 pm and 4 am at weekends in 2013 for a total of 3,401 hours. Amongst other practical activities they picked up and disposed of 2,145 bottles and cans which might otherwise have caused injury, particularly to barefooted young ladies who weren’t among the 508 recipients of a free pair of flip flops.